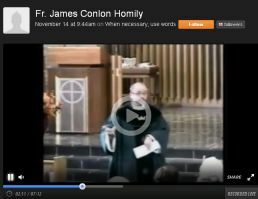 Watch the Sunday 10:30 a.m. Mass here. Each Sunday the 10:30 am Mass is webstreamed here on our Parish website for those who are homebound or ill and are unable to attend Mass. Live broadcasts start a few minutes before the event begins, and ends when the event is over. Ustream’s video technology will allow our broadcast to be viewed on iPad, IOS, Kindle, and Android, as well as on traditional computers. On desktop or laptop computers, when it’s time for the mass or event, please click on the image at the right. When we’re not broadcasting live, you will automatically see our most recent recording. On mobile devices, the links below will allow you to view previously recorded material. In order to view the live broadcast, please install the free Ustream app which you can get from the App Store or the Google Play Store. Thn, when you launch the Ustream app, search for “when necessary use words“. If your computer won’t play it, or you have questions or comments about the webstream, please contact us. Nov. 22 2015, Brother Guy Consolmagno,S.J.